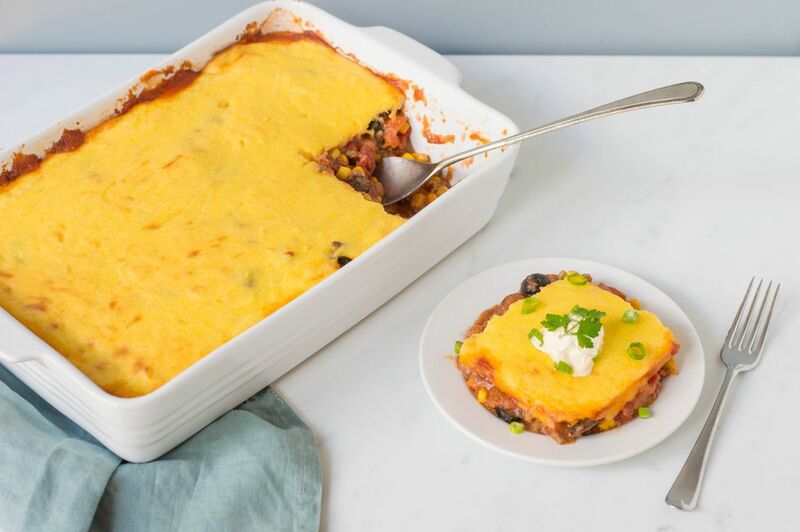 This spicy tamale pie is a classic combination of seasoned ground beef, tomatoes and corn with a cheesy cornmeal topping. The casserole is seasoned with onion, bell pepper, garlic, chili powder and ripe olives. Not only is this an easy preparation, it's super easy on the budget. The casserole is big enough for six hearty servings. Add a tossed side salad, refried beans or beans for a satisfying dinner or serve it with easy Mexican rice. Grease a 2 1/2-quart or 9-by-13-by-2-inch baking dish. Heat the olive oil in a large skillet over medium heat. Add the ground beef and cook, stirring, until the beef is no longer pink. Add the chopped onion, garlic, and bell pepper; cook for 2 minutes, or until just tender. Stir the tomatoes, corn, and seasonings into the ground beef mixture and simmer for about 5 minutes longer. Mix 1/2 cup cornmeal with 1 cup water. Stir into the ground beef mixture in the skillet. Cover and cook over low heat for about 10 minutes. Add the sliced olives to the beef mixture and stir to blend thoroughly. Pour the beef mixture into the prepared baking dish. Set aside while you make the topping. In a medium saucepan, heat 1 1/2 cups milk with 1 teaspoon salt and the butter. When the milk is hot, but not boiling, gradually stir in the 1/2 cup yellow cornmeal. Continue cooking until thickened, stirring constantly. Remove from heat and stir, then add the cheese and beaten eggs. Stir to blend. Pour the topping around the edge of casserole. Use Mexican or fiesta-style corn with peppers in place of the whole kernel corn. Instead of plain diced tomatoes, use zesty chili-style, stewed tomatoes or fire-roasted. Make your own homemade chili powder seasoning blend. Combine 1 teaspoon each of garlic powder and ground cumin and 1/2 teaspoon each or cayenne pepper, dried leaf oregano and paprika.